Most programmable controllers will come with a RS232 communication port. This recommended standard (RS) has voltage signals in the range between 3 to 15 volts DC with respect to the ground/common pin. RS232 devices are classed either DTE (data terminal equipment) or DCE (data communication equipment). The maximum cable length for the communication cable is 15m, however depending on the environment I have seen this as much as 50m without an issue. 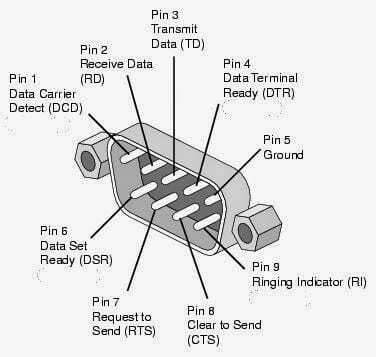 Most RS232 connectors are 9 pin like the diagram below, but they can also come in 25 pin or RJ45 connectors. A minimum 3 wire RS232 connection consists of only the transmit data, receive data and ground. This is commonly used if full handshaking is not required. Note: I always jump Pin 4 and 6 out together on each side. The shield on the connection cable should only be connect to one housing when making the cable. I usually connect it on the PLC end. Note: The shield on the connection cable should only be connect to one housing when making the cable. I usually connect it on the PLC end. 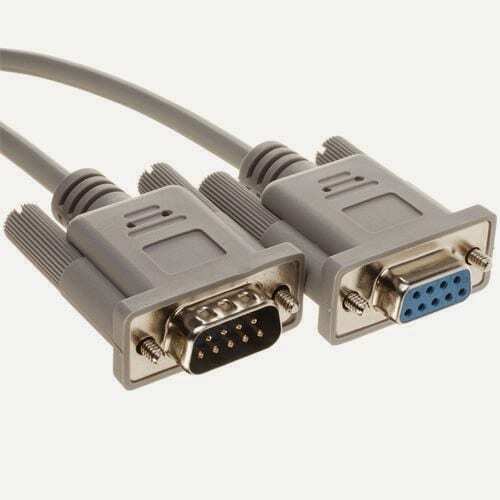 RS232 is a one to one communication method. (1:1) This means it is designed to communicate to one device. If multiple devices are needed,(1:N) RS422 or RS485 should be used by way of converters. If you have any questions or need further information please contact me. Allot of times in industrial environments we get noise on the analog signal input to PLC’s or other controllers. The noise can be generated by motors, bad wiring, etc. Placing a 1- 100 uF capacitor on the input signal and ground (common to the cabinet) will reduce the noise that the input is receiving. 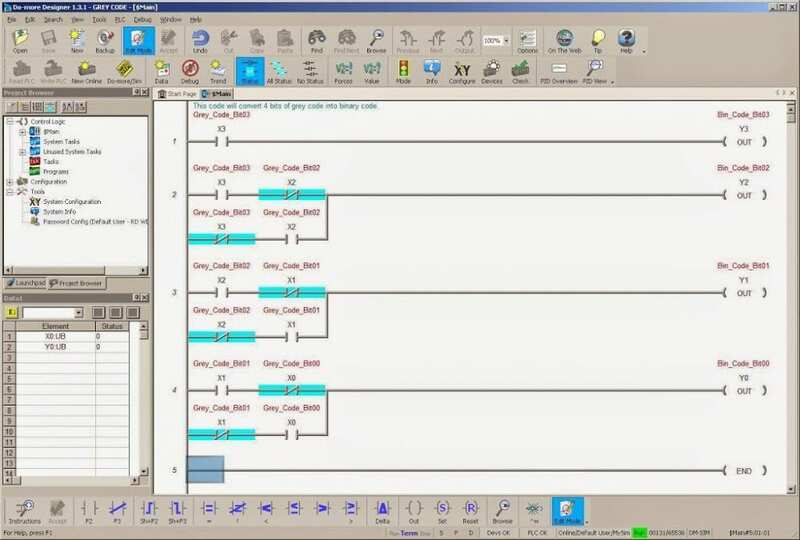 Who Else Wants To Lean PLC Programming For Free? I will not get into allot of details because the documention available already will get you through the software step by step. – Use the YouTube videos for help with getting around the software and making your first program. 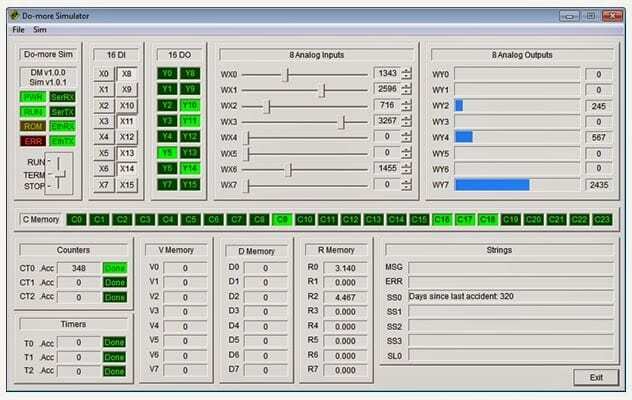 The simulator has allot of great features, including PID simulation. Let me know if you have any questions or need further information. Grey Code is used because only one bit of data will change at a time. The following chart shows the conversion of Grey Code to Binary. It is important for absolute encoders because if the power is interrupted the encoder will know where it is within the one bit. Power is interrupted when the encoder is between 7 and 8. 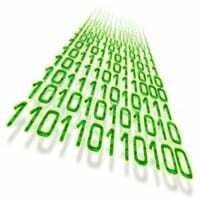 If we are looking at Binary Code all of the bits would be effected and we would not be sure as to what number we are looking at for the encoder. Therefore we have lost position. In Grey Code only one bit changes so we will still be able to tell if we were on 7 or 8 if the power was interrupted. 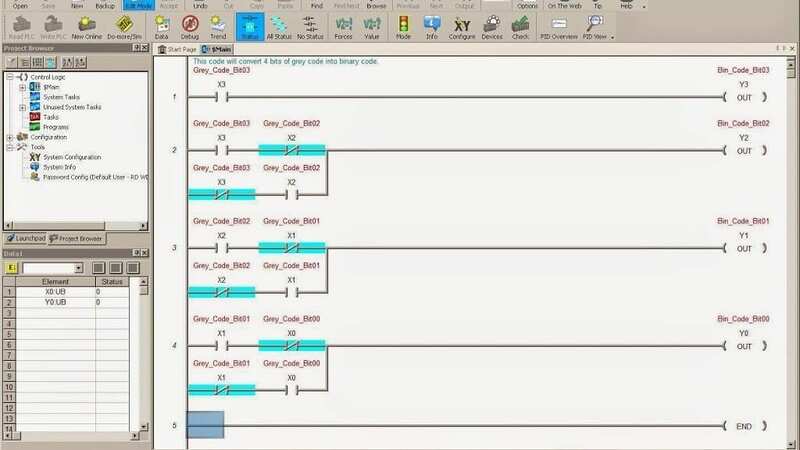 The following sample PLC program will convert 4 bit grey code into binary code. This code was written in an Automation Direct PLC software called Do-more Designer. Contact me for the above program. I will be happy to email it to you. Programmable Logic Controllers (PLC) are the same as computers. They only understand two conditions; on and off. (1 or 0 / Hi or Low/ etc.) This is known as binary. The PLC will only understand binary but we need to display, understand and use other numbering systems to make things work. Let’s look at the following common numbering systems. Binary has a base of two (2). Base means the number of symbols used. In binary the symbols are 1 or 0. Each binary symbol can be referred to as a bit. Putting multiple bits together will give you something that looks like this: 100101112. The 2 represents the number of symbols/binary notation. Locations of the bits will indicate weight of the number. The weight of the number is just the number to the power of the position. Positions always start at 0. The right hand bit is the ‘least significant bit’ and the left hand bit is the ‘most significant bit’. We start with the least significant bit and work our way to the most significant bit. Note that the we just converted the binary number to our decimal numbering system. The decimal numbering system is not written with a base value of 10 because this is universally understood. To be sure we have the concept down, let’s take a look at our decimal numbering system the same way as we did the binary. Decimal has a base of ten (10). The symbols are 0, 1, 2, 3, 4, 5, 6, 7, 8 and 9. Every for bits of binary represent one hexadecimal digit. In our original binary number we now can convert this to hexadecimal. The following chart will show all of the combinations for 4 bits (nibble) of binary. Its shows the Binary, Decimal and Hexadecimal (Hex) values. It is interesting to not that Hex is used because you still have only one digit (Place Holder) to represent the nibble of information. Each time you hit a key on your keyboard, the following 8 bits of data get sent. A word is made up of two bytes, or 4 nibbles, or 16 bits of data. Words are used in the PLC for holding information. The word can also be referred to as an integer. Long word / Double word is made up of 4 bytes, or 8 nibbles, or 32 bits of data. Long words are used for instructions in the PLC like math. Hey what about negative numbers? Signed words can hold negative numbers. Bit 15 (most significant bit) of a word is used to determine if the word is negative or not. The following table shows you the signed vs unsigned numbers that can be represented in the PLC. When working with PLC’s look at the memory tables to determine what will happen if power is removed from the device. Will the bits go all off or retain their prior state? Usually there will be areas that can be used in the PLC for both conditions. 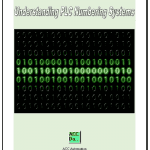 As you can see PLC numbering systems and computers are very much related and it all boils down to individual bits turning on and off. The interpretation of these bits will determine what the value will be. 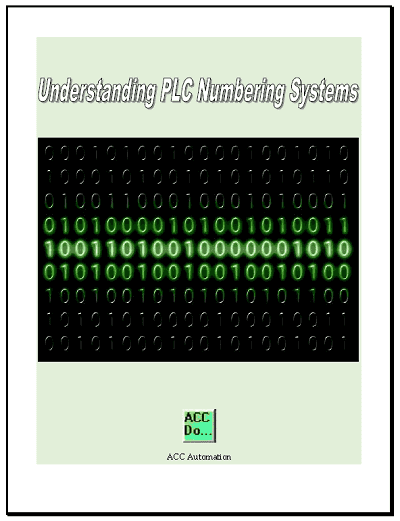 Let me know your thoughts, or questions that you have on PLC numbering systems.